Whether you've happened upon an injured squirrel or a skunk making a home in your backyard, you're not alone in wondering how to deal with the situation. We've collected the most commonly asked questions we get at the Canadian Wildlife Federation here for you! Question: I love to garden but I get so many bites and stings — how can I protect myself? It seems we’ve been waiting a long time for spring to arrive so we can get out and garden. 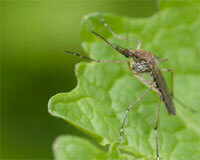 But now that the nice weather is finally here, it seems the pesky bugs are too! But don’t give up on tending to those gardens just yet! Check out this list on how you can protect yourself from bites and stings and enjoy your gardening adventures. Make sure to dress appropriately. Wear loose fitting pants and a long sleeve shirt. Yoga-style pants aren’t recommended as many bugs can bite/sting right through spandex. It’s also a good idea to tuck your pants into your socks. Gardening gloves and a hat will also help! And don’t forget to wear close-toed shoes. You don’t want to accidentally step on a nest. Insects are attracted to dark coloured clothing, so make sure to dress in light coloured clothing when you garden. Bugs can be attracted to fragrances so the fewer fragranced products you use, the fewer insects you just might attract. Plan your gardening activity for when there are the least amount of bugs, typically avoiding dawn and dusk although some, like deer flies, which you might spot later in the summer, are active during the hotter parts of the day. Ask a question of one of our wildlife experts and we'll try to respond as quickly as possible!